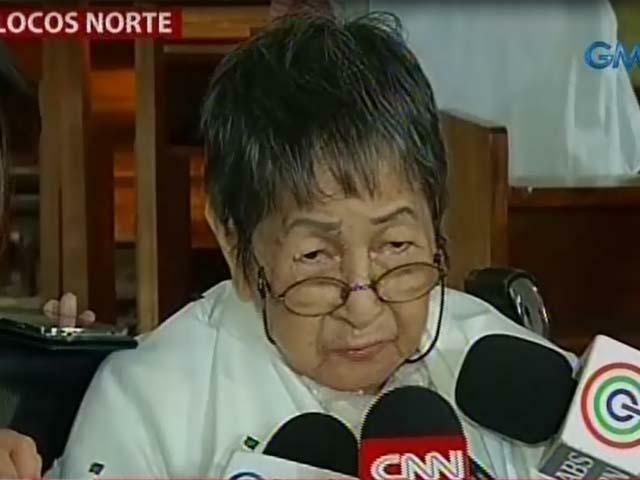 →Marcos’ younger sister speaks up: Apologize for what? Marcos’ younger sister speaks up: Apologize for what? The youngest sibling of the late President Ferdinand Marcos on Wednesday said no apology is needed from the family since there is no proof that her brother was responsible for the atrocities during Martial Law. Fortuna said the critics of Marcos bear the burden of proof, as she blamed the military for the human rights violations and abuses committed during her brother’s reign. “They have to prove that talagang he was the one responsible sa karahasan. Hindi naman ganon, hindi ganon ang pagkakaalam ko. Most of it I guess must be because of the military. Siyempre iba-iba rin ang pag-iisip ng tao,” she said. Fortuna led the first of the nine-day palualo, a special prayer for the deceased, in Ilocos Norte in preparation for Marcos’ burial at the Libingan ng mga Bayani, which has been allowed by the Supreme Court. Meanwhile, petitioners against the granting of hero’s burial to Marcos stressed that the Supreme Court ruling is still not final and executory. Former Bayan Muna party-list Rep. Neri Colmenares said the Marcos family should wait for the Supreme Court to rule on their motion for reconsideration first before pushing through with the burial. “Ang sinasabi lang naman namin doon, i-recognize naman ng mga Marcoses ang due process rights ng mga biktima na mag-MR. Otherwise kung ilibing nila ng madalian, baliwala na yung MR,” Colmenares said. “Ano ba naman na maghintay ang mga Marcoses ng isang buwan pa or so para masolusyunan ang MR?” he added. A group supporting President Rodrigo Duterte, who is in favor of giving Marcos a hero’s burial, said the issue should not be taken as something else other than a fight between two political families. “Yan ay talagang issue ng away between two families: ang pamilya Marcos at pamilya Aquino. Unang una, ang mga Aquino ang unang tumututol sa pagpapalibing ni Marcos,” PDU30 Core convenor Lorenzo Gadon said in the report. Bantayog ng mga Bayani spokesperson May Rodriguez, on the other hand, described the burial of Marcos at the Libingan ng mga Bayani as another move to sway public opinion in favor of the Marcoses. “I think ito ay device ng mga gustong magpaliit sa paglaban kay Marcos, device sa paglito sa mga tao na ‘yan nga ang katotohanan,” Rodriguez said. The Marcos family has yet to issue the exact date of the burial for the late dictator but the Philippine Army confirmed the resumption construction works at the elder Marcos’ grave site at the Libingan ng mga Bayani.